Frost Hall, designed by Wallace Neff. During 1909, Walter W. Bristol organized the Nordhoff Union High School in the town of Nordhoff, now Ojai, and became the school’s first principal. He held that position until 1919, when he resigned to assist his wife in the running of a small country school that she was operating, known as the Bristol School. Mrs. Bristol’s school had started in the fall of 1912, with two students. Classes were held in her home on the northwest corner of Ojai Avenue and Bristol Road. The house had been built in 1911, and it was typical wooden construction with a screened-in sleeping porch that ran across one end. By 1913, the sleeping porch had been divided into classrooms and desks were installed, so as to accommodate more pupils. The need for a progressive private school was very much in evidence in the small western town. Before long, a separate school building was erected farther north on their property. The Bristols felt that their new building would probably accommodate up to 15 pupils, but before long that total had reached 25 pupils. It was indeed a crowded little school. The great forest fire of 1917, which had burned the Foothills Hotel and 60 other building in the Ojai Valley, also destroyed the charming little Bristol School. The fire, however, did not burn the cottages that were on the same property, so classes continued. The Bristols had been asked to board students at the their school, but there had not been enough room. Now that the building was to be rebuilt, they made plans to include rooms for boarding students and three classrooms. It was a very successful school. The outdoor life in a superb winter climate and amidst charming scenery made the school life both wholesome and attractive. Another person who had a profound interest in the local children’s education was Edward Yeomans. Arriving in the valley for the winter of 1912, Yeomans was not happy about coming to California from his home in the east. He was working for the family business, Yeomans Brothers Co., a water pump manufacturing company, and his feelings about California were that it was merely a vacation spot for rich bankers with whom he had absolutely nothing in common. However, the beauty of the Ojai Valley and the simplicity of life here convinced him that he could find no better place in which to spend the winter. Yeomans heard that the Bristols would be interested in selling their school and property, but Yeomans was not interested in the Bristol property or the buildings, so the Bristols agreed to sell him only the goodwill in the school. A meeting of the prominent local residents was called to discuss the plans of Yeomans’ new school. A name was decided upon, the Ojai Valley School, and it would need to have beautiful buildings in order to be a credit to the community. Mary Bard, the wife of Senator Thomas Bard, attended the school meetings, and she was the most enthusiastic person there. Mary Bard had married the senator in 1878, and they had seven children. It was not surprising that she was interested in education. Mary Bard was much stirred and inspired by Yeomans’ talk and said she wanted to do whatever she could in order to help start such a school. Frank Frost, another valley resident, also wanted to do his share of work toward the new school. E. D. Libbey, Ojai’s greatest benefactor, had just subdivided a large tract of land and had named it the Arbolada; and Frost felt that the lots in the subdivision would sell more rapidly if there were a school nearby. Frost wrote to Libbey in Toledo, Ohio and said, “You never can sell your land unless you can also say there is a good school nearby.” It was just the right message. Libbey donated a parcel of land to the group with only one restriction. They could have any amount of land they required, but it had to remain in the ownership of Libbey until three years had passed and the school had succeeded. 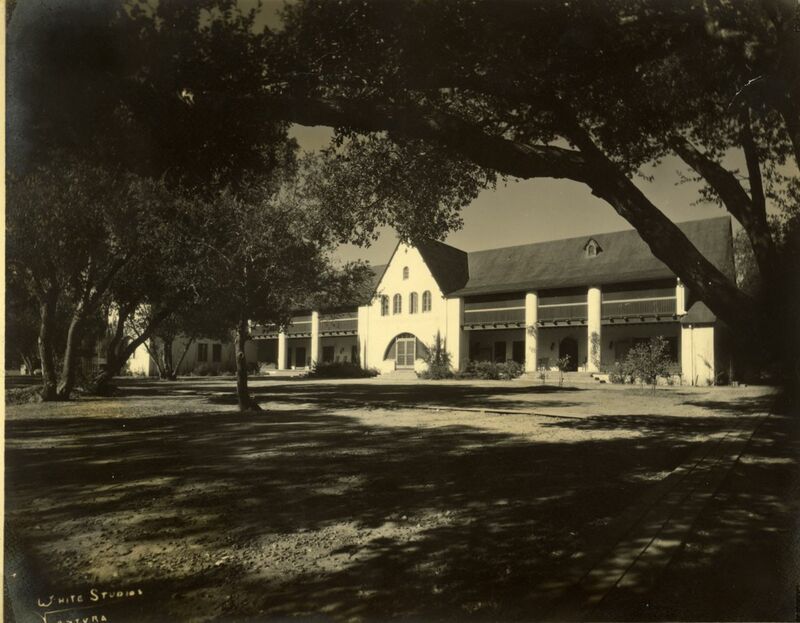 The Ojai Valley School officially opened for business in October 1923. With so many students requesting to attend the new school and wanting to be boarding students, Frost decided that to do his part, he would build a dormitory for the school. He supervised the building, which originally would hold 30 students, and it was filled to capacity the first day. As word spread up and down the state about this new school and the progressive learning that was taught there, people became anxious to hear all they could about it. Invited to speak at a large function in Los Angeles, Yeomans found himself extremely nervous in front of the crowd of people. Once he had spoken a few words, in which he referred to himself “as a pump manufacturer, not an educator,” he became at ease. He said he “was there as a rebel against his own painful and unhappy education in childhood, where fear ruled his entire life and school was a prison.” At that time he had promised himself when he grew up, he would try to save other children from such an unhappy life. Libbey advertised the new school in his sales brochures for his Arbolada lots. “In this lovely sport, far away from the noise and crowding of city schools, children are given a superior training” and a far finer appreciation of life. The purpose of the school is “to cherish and develop the individuality of each pupil rather than to turn out a rubber stamp product.” This proved to be a successful move for both. I read your article about the donation of land for the Ojai Valley School by Edward Libbey in 1923. Can you tell me how many acres he donated originally and did he ever donate 7 additional acres later? How many acres are presently owned by the OVS Lower Campus for academics? I am the grandson of Edward Yeomans, who founded the OVS in 1923, and I notice in your writing of the history that you do not spell his name correctly. Would you fix this on the website and let me know that you have done this? Thank you. I was there for the 100th anniversary of the school and gave the keynote address at the celebration. The film of this is on the OVS website, I believe. You might want to add this event to your narrative. I look forward to hearing from you and send every good wish.